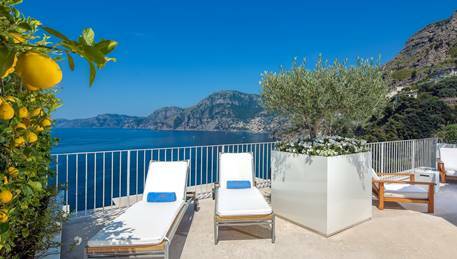 Casa Angelina on Italy's Amalfi Coast has announced exclusive offers for Australian guests wishing to stay at this stunning boutique hotel during the European Spring and Autumn in 2017. Casa Angelina overlooks expanses of the Mediterranean Sea from a cliff-edge perch in the quiet and picturesque Campania village of Praiano, which is only a 10-minute drive from Positano and 15 minutes from Amalfi. The property, which welcomes many Australians to enjoy all the magnificence and splendour of the Amalfi Coast and its surrounds during the beautiful European Spring and Summer months, operates seasonally and will be available in 2017 for bookings from 5 April to 27 October. Children from 12 years of age are welcome to visit. The special offer for Australian guests applies to Spring bookings confirmed by 15 May 2017 for minimum 2-night stays from 5 April to 31 May 2017 and Autumn bookings confirmed by 15 October 2017 for minimum 2-night stays from 1 October to 27 October 2017. Casa Angelina room rates are from EUR305 (approx. AUD439) per night excluding 10% VAT and City Tax for 2 people in a Classic Room inclusive of buffet breakfast, parking, return scheduled shuttle bus service to Positano, Wi-Fi internet connection in guest rooms and public areas, use of gym and sauna and access to La Gavitella Beach via hotel elevator and 200 steps. For bookings, contact The Unique Tourism Collection on info@uniquetourism.com or your local travel agent. A member of Design Hotels, Casa Angelina provides a welcoming embrace, with guests able to leave a little of the world behind, safe in the knowledge that they will find the time and space to rediscover those forgotten rhythms of long days and easy nights. The timeless elegance of style and service at Casa Angelina combines with cosseting accommodation, gourmet cuisine, restorative wellness therapies and an unsurpassed location, delicately perched above the azure tranquility of the Mediterranean. Casa Angelina features 39 exquisite and luxurious rooms and suites, plus 4 ultra-exclusive Eaudesea rooms, almost at sea level. During 2017, Eaudesea Rooms will again be available from 15 May to 15 September and will offer guests 2 one-way complimentary water taxi transfers to or from Positano during the stay. The gourmet restaurant, Un Piano nel Cielo, showcases seasonal, locally sourced Mediterranean cuisine, while the poolside dining offers easy, healthy salads, pastas, and other lighter dishes. One can dip into the heated indoor or outdoor pools at will, and bask in the summer sun on the poolside deck, relaxing while life goes on elsewhere. The spa pampers and soothes the soul with a comprehensive range of beauty and wellness treatments sure to refresh and unwind to and guests can also wander down to the local beach for a drink from the seaside bar or head out on a trip on one of Casa Angelina's private boats.